In your book you write about the psychologist William James and his comparison of the brain to a prism. How does this relate to psychic phenomena? He believed consciousness is not just what's happening to the neurons in the brain. The brain is our instrument in focusing and organizing our consciousness. Just like a prism will take a white light with all these different frequencies and separate it so you can see the different colors of the spectrum. Rather than us experiencing everything that's happening all at once, our brain focuses us on the here and the now. It uses our sensory organs as guides as to what we should be focusing on. Experiments have shown that most psychic experiences occur when are sensory organs are muted, like when we're dreaming or having a near-death experience. In your book you mention Abraham Lincoln as one of the more famous examples of precognitive dreaming. Lincoln had a very vivid dream of walking around the White House and hearing all these people mourning and asking, "What's going on?" and then having someone tell him, "The president's dead." Then he saw his own corpse. He had this dream literally ten days before he was assassinated. He didn't tell anybody about it at first, but a few days before [his assassination], he told his wife and some friends. Of course, that's not true of all dreams. Some dreams actually are tapping into some other time and place, and there's real information in them. Others are just imagination. I think that's one of the reasons why psychics don't have 100% accuracy, sometimes it's just their imagination. What I'm interesting in is trying to discern what it is that makes those experiences so different. Tell me about the stigma associated with scientists who study psychic phenomena. There are theories about how the brain works, and what people do is design experiments to generate data that fits with that theory. If they run into data that doesn't fit into their theory, they just ignore it. But a true scientist will throw out the existing theory if they have a lot of data that cannot be explained. Theories are man-made, and therefore fallible. Data is what's most important. That's why we have penicillin. The scientist who grew this bacteria didn't just throw it out. He looked at it and asked, why aren't bacteria growing in this plate, and he noticed there was mold in it. If he had thrown out that plate, we wouldn't have penicillin. You write that it's likely everybody possesses psychic abilities, but some people are simply more successful at it? Why is that? Genetics are likely behind it. One of the things we know is that it runs in families. If you talk to psychics, they'll tell you there's a family history of it. Though we haven't found it, there's likely a gene for it. There are also cases where people haven't had any psychic abilities until they've suffered head traumas. What's common is that these people who've had this head trauma, the structure and function of their brain has been changed. They're often not able to function very well in the real world because they don't know how to use the analytical side of their brain. Similarly, people with synesthesia [a condition in which the senses are connected, i.e. the sound of an orchestra will cause flashes of color or the taste of chicken] have less activity in their cortex. People with autism also have a higher probability of psychic abilities. 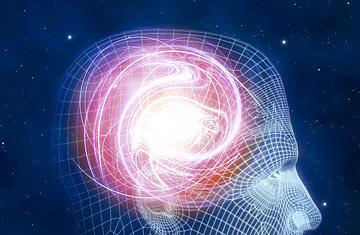 How do quantum physics and Albert Einstein's theories relate to precognition? If you stop thinking of time the way those in the Newtonian age thought of time as an arrow, and you start thinking of time as the way that Einstein thought of it as a space-time continuum, the future already exists. Just like the entire globe of the earth is all there even though I'm not currently seeing it all here in Southern Oregon. Our brain only allows us to experience time as a series of recurrent moments. What Einstein's saying is that when we're talking about time we're really talking about a psychological construct. Time is like any other dimension in that it isn't limited. Like space, we have up and down, east and west, they go bidirectionally. Why would time be something different than that? If we didn't have the constraints of our brain and our psychology that limit our experiences, we would be able to see that.